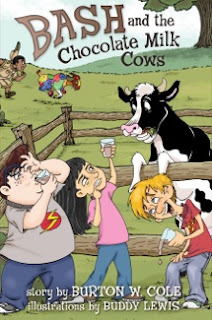 Hop inside the book, "Bash and the Chocolate Milk Cows" and you and your kids can take a trip to a country farm where Bash and his cousin, Beamer, think of fun ways (including pranks) to pass the time. While you are there, you can also follow Beamer as he learns more about Baptism and The Great Commission. I used this book as a "read-a-loud" this Summer. I figured my 12-year-old son would enjoy it, since it is geared towards 8-12 year old boys. But, there is a lot of awkward dialogue at the beginning of the book that made it a bit hard for us to engage. My son and I sort of lost interest after the first couple of chapters, and gave up on reading it. But, don't refuse to read it just based on my initial opinion. As I scanned the rest of the book, it does appear to get more interesting. We just had other interests to pursue this Summer. I applaud the author for writing fun books for kids that also intertwines discussions on Christian beliefs. Note: I received this book free from Shelton Interactive for the purpose of this review.